Coming February 2, 2019. 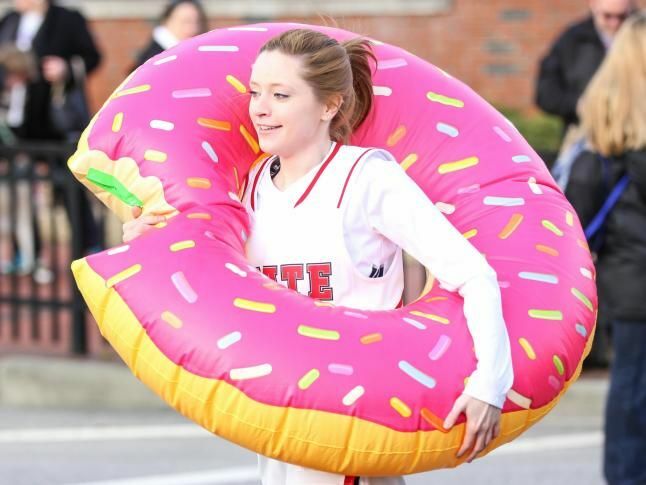 Eat donuts and run for a good cause! Starting out as a college dare, the Krispy Kreme Challenge has evolved over the past 14 years as a formidable charity race that has raised more than $1.5 million in support of the UNC Children’s Hospital, consistently recognized as one of the best children’s hospitals in the United States. Very impressive! Here’s the scoop on the Challenge: run a full five miles plus eat a dozen doughnuts (that’s equivalent to 2400 calories! ), all in one hour or less! Yikes! Don’t worry though, you can decide to eat some or none of the donuts and still participate. Starting at the Memorial Belltower on the campus of North Carolina State University, runners then travel 2.5 miles through historic downtown Raleigh, scarf down the donuts (or not! ), then run back to Memorial Belltower. Costumes are encouraged, so you’ll see fun things like giant donuts, super heroes, hot dogs, and more.